Not only will you find great savings, but you will be vacationing in luxury at our Windsor Hills Resort Condominium! You will be located less than 2 miles from Disney World. Beautiful family orientated 3 bedroom and 2 full bath luxury condo. 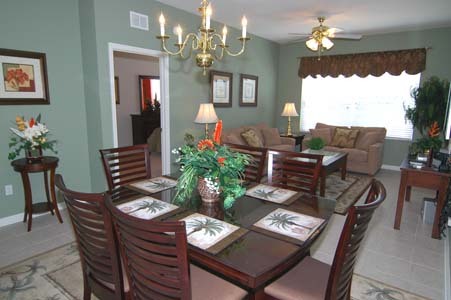 Windsor Hills is a premier vacation resort that is the closest residential community to Disney. It is a new, gated resort with a breath-taking pool and clubhouse that is near many shopping plazas, restaurants, fast-food eateries, medical care and attractions (within a mile from the resort). Not only will you be close to Disney World but also only 15-20 minutes from Universal Studios, Sea World and the Orlando Convention Center on International Drive. For as little as $69.00 a night (save even more for longer stays), stay in our condo rather than a hotel complex. Click below to check out our GREAT DEALS under "RATES and TERMS." With all the amenities of a 5-star resort, you will experience a magical vacation that you and your family will remember for years to come. Enjoy breakfast, lunch and dinner in our lovely dining area. Relax while watching a movie or television in the living room on a big-sreen TV or on mounted 32-inch LED televisions with DVD players located in each bedroom. The property is also professionally managed with a 24/7 maintenance service. If you're a golfer, there are many championship courses within minutes of the resort. Free long-distance calls to anywhere in the United States, Canada and Puerto Rico are also included. Bring your laptop and tablet and stay in touch with everyone back home. Wireless high-speed internet is included. You will be saving yourself from the high prices that a hotel or resort will charge while still enjoying all the luxuries you could ask for. You can relax and enjoy the wonderful Orlando weather and resort ammenities for a fraction of the cost of other resorts. Why pay for a hotel room when you can be staying at a luxury resort for less than the cost of a room at a major chain hotel? Don't rent two or three hotel rooms when your party can stay in one unit for a cost less than one hotel room!